The prevalence of low back pain across America and the entire world is growing out of control. A recent survey taken by the APTA (American Physical Therapy Association) reports that nearly two thirds of Americans experience low back pain, and 37% do not seek professional help for pain relief. According to the World Health Organization, low back pain is the leading cause of activity limitation and work absence throughout much of the world. This is imposing a high economic burden on individuals, families, communities, industry, and governments. So… Let’s do something about this! Prevention of these injuries is the best place to start. Let us attempt to keep your back safe this winter by discussing some simple tips. While finishing stacking your wood for the winter, it is important to start with correct lifting techniques. Many people believe they know how to lift with proper mechanics, however still manage injure their low back. It comes down to more than just “bending your knees.” Let‘s go over some easy rules to remember. ~ Always bend at the hips, not the back. Bending just your knees will not ensure a safe lift. If only the knees bend, the back is still at risk for curving causing a low back injury. Think about keeping your chest upright, pointing forward. This will help to keep your back straight, while your hips and knees actually do the bending. ~ Do not twist. Always lead with your hips when changing direction rather than your shoulders. It is important to turn your body as a whole and place your load directly in front of you. This is true when picking up an object as well as putting down an object. ~ Keep the load close to your body. The farther away an object is held from your center of gravity, the more force it requires to hold it up. Muscles and structures in your low back are responsible for keeping your body upright. If they are stressed with too much load far away, there is risk of injury to any and all of these structures. One common cause of low back injury during the winter in New England is shoveling snow! There are several factors that contribute to this. This is a repetitive activity that places stress to the low back over a prolonged period of time if done incorrectly. Secondly, many people want to save time by twisting and throwing snow for faster clearance. You must stay to the basics of lifting that we discussed above to keep your low back safe from injury. Here we will go over some additional tips for shoveling specifically. ~ Warm up with a short brisk walk or marching in place to increase blood flow to muscles before strenuous activity. ~ Choose a shovel that is lightweight with a plastic blade. This will reduce the overall weight you will be lifting. ~ A shovel with a curved shaft or adjustable handle will allow the blade to be on the ground while minimizing the possibility of painful bending. Whenever possible, try to push the snow to one side rather than lifting it. Be conscious of minimizing your forward bending and twisting while doing so. Refer to above easy tips to lifting 1-3 as guidelines to ensure proper technique. Use a split stance and power from your legs to lift. ~ Keep your load light rather than trying to lift a load that is too heavy for you. 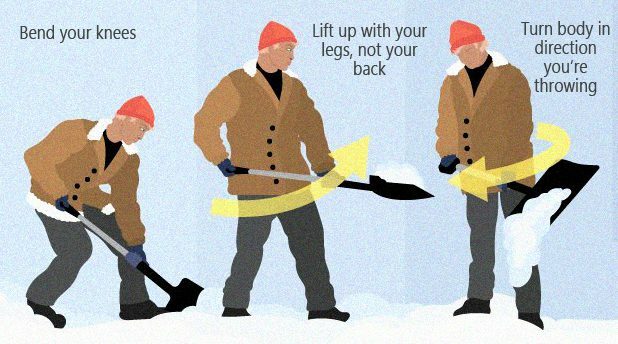 If required to lift heavy snow, grip one hand on the shaft of the shovel close to the blade with the other hand on the handle. This will allow you to keep the heaviest part of the shovel close to your body and center of gravity. ~ Avoid twisting the back and extending your arms to throw the snow. Rather, walk to the area you want to deposit the snow and align your body facing forward to dump. Always pivot your body as a whole. Do not allow your shoulders to face a different direction than your hips. ~ Pacing yourself is important. Take a break for 1-2 minutes every 15 minutes to avoid overworking and stressing the low back. If the snow is deep, remove a few inches from the top rather than trying to remove the entire depth at one time. It may even be a good idea to remove snow over a period of a few days if possible to reduce overall stress to structures in the spine. Many of you have already injured your back in the past and find that it still bothers you during tasks like this each year. You may benefit from a formal evaluation of your back pain and one-on-one education for injury prevention with one of our skilled physical therapists. Hampton Physical Therapy at both our Hampton and Seabrook locations offer a variety of manual treatments including Dry Needling, Graston Technique, Neural Mobilization and Spinal Manipulation that should help to get you back on your feet! Feel free to contact us with any additional questions.